This is the second post in my courses of Thanksgiving. The first post, if you missed it yesterday, was a light yet tasty salad. But now we are ready to move on to something a bit more filling. A lot of people like deviled eggs for Thanksgiving and I like them also. They are traditional. But sometimes for an appetizer, I want something that packs a bit more flavor. 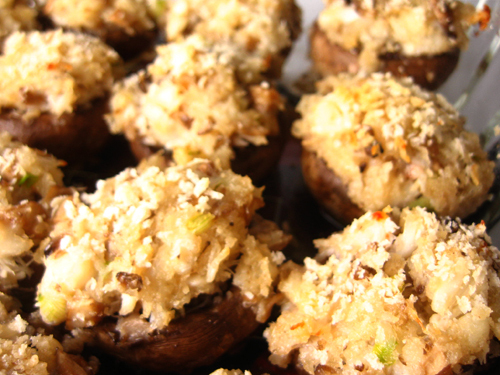 These crab stuffed mushrooms fit the bill. 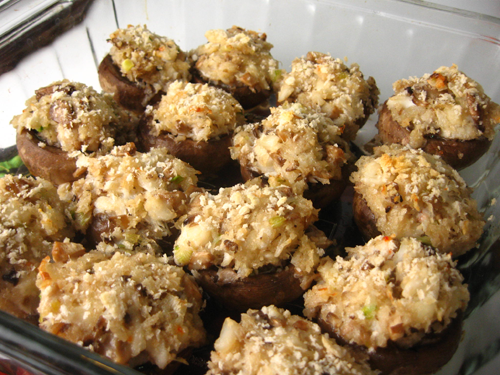 Deliciously rich crab stuffed mushrooms. The perfect appetizer for the holidays! 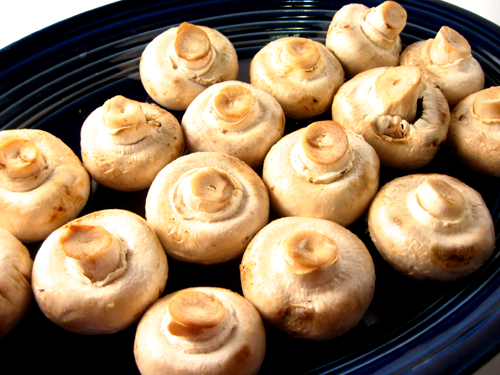 1) Preheat oven to 425 degrees F. Use a paring knife to hollow out mushrooms. 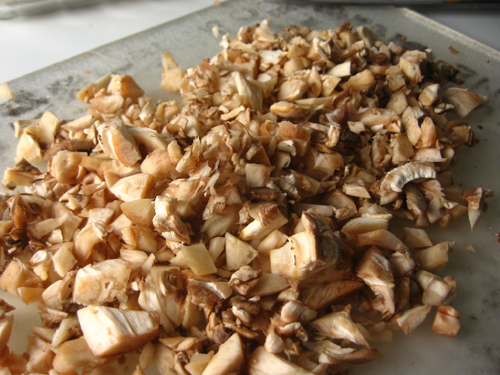 2) Chop chems roughly from mushrooms and measure out about 1/3-1/2 cup. 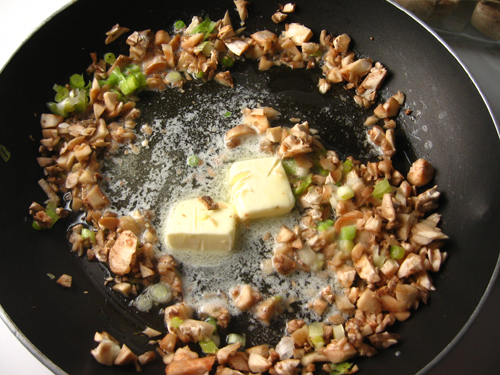 3) In a large skillet, melt butter over medium heat and add chopped stems, onions, and garlic. Add a pinch or two of salt and let that start to cook down for about 4 minutes. After that add your crab, Parm, and 3/4 cup bread crumbs. 4) Once filling is cooked, spoon filling back into mushrooms. YOu can really stuff them full. in your filling. Dust mushrooms with extra breadcrumbs or panko. 5) Bake for 15-20 minutes. Then cool for 5 minutes and serve them up! 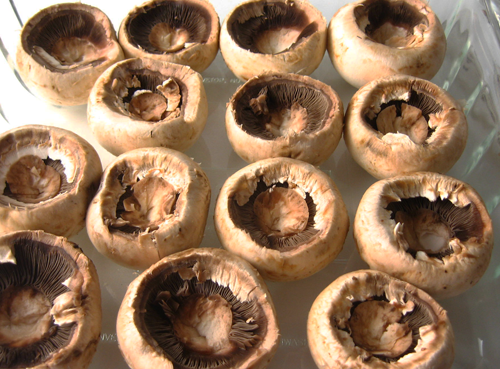 Like I said, the best mushrooms for stuffing are just plain old button mushrooms. Don’t get too fancy here. These are just the container for a wonderful filling. But before you can fill them you have to hollow them. I like to use a paring knife to just work out the stem. Just remember. The more you take out, the more you can put in. But before you get started dissecting, pre-heat your oven to 425. Now whatever you do, don’t throw away those stems! We are going to use them as a base for our filling. Yes. That is right. You stuff mushrooms with mushrooms. It’s the best way to handle it. To help the stems combine better with the crabs and butter and yumminess, you want to give them a pretty good chopping. Now we are only going to use about 1/2 cups of these. You don’t need more than that. You stuff mushrooms with, well, mushrooms. Now we make the filling. Start out with your chopped stems, onions, garlic, and butter in a sautée pan on medium heat. Add a pinch or two of salt and let that start to cook down for about 4 minutes. After that add your crab, Parm, and bread crumbs. This is a lot of butter, but not A LOT of butter. Now it is as simple as spooning in your filling. This is one time where I tend to break they “don’t overfill” rule. I fill these suckers as high as they will go. There is no reason to have filling left over. Then just dust them with some extra Panko or breadcrumbs to give them a crispy top. Overflow is the way to go. Into the oven they go! These take between 15-20 minutes to cook. Keep a good eye on them. You don’t want to get too soggy. I like might just a bit firm. You will also want to let them cool for 5 minutes before you bite in. These suckers get hot. I hope you make these and enjoy them. I’m sure there are tons of other things you could stuff in a mushroom and honestly if you don’t have crab the filling is pretty delicious without it. Please make these though. Your relatives will thank you. Stay tuned for one more appetizer dish before we move onto the main courses. If you get sick of typing in www.macheesmo.com, you can always get these posts delivered straight to you for free! Try out either the email flavor or the RSS flavor. 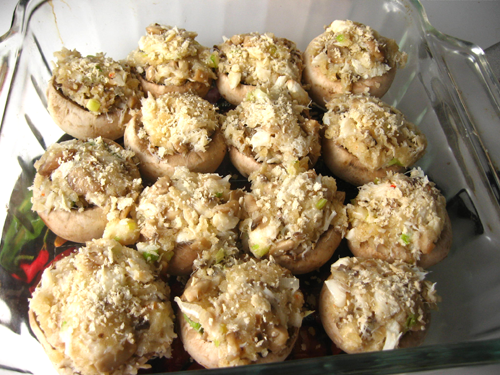 These look fantastic–I love stuffed mushrooms! And I only recently discovered panko and that it is so fantastic and useful. It is now a staple in my pantry.